The Bodleian Libraries are committed to working towards solutions to digital preservation for the items held in ORA. Information on how theses are displayed in ORA and how ORA links with SOLO and Ethos (British Library). Students who began their programme of study following a D.Phil., M.Litt. and M.Sc. (by Research) from 1st October 2007, are required to deposit a hardbound and a digital copy of their thesis with the Bodleian Libraries under Examination Regulations. The digital copy should be deposited in the Oxford University Research Archive (ORA). Students completing D.Clin.Psych, Doctor of Medicine, M.Phil., Master of Studies in Legal Research (M.St.) or Bachelor of Philosophy (B.Phil.) can voluntarily deposit a digital copy of their thesis into ORA. Oxford alumni are also invited to deposit a digital copy of their thesis in ORA. ORA contains a growing collection of digital copies of successful Oxford theses submitted as part of research degree awards. 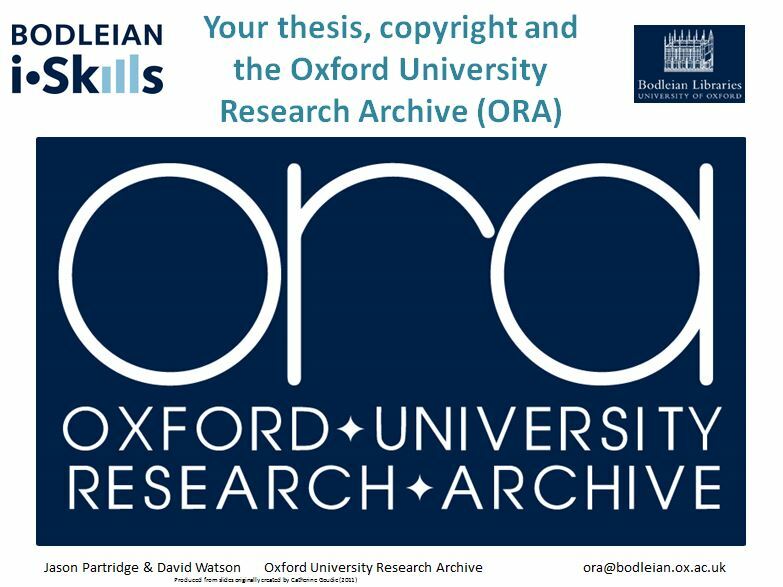 ORA provides high visibility and digital preservation for Oxford digital theses and the full content of as many theses as possible are made freely available to be accessed via the Internet. They should be used in accordance with the Terms and Conditions of Use. Your thesis will be made available online following a selected one or three year embargo period unless you have opted for immediate open access or have been granted dispensation from consultation to extend the embargo on your thesis. Plagiarism can never be guaranteed to be prevented in either the print or electronic domain. When items are made available on open access (i.e. with no barriers to access) it is easier to detect plagiarism. For example, a supervisor who suspects that plagiarism has happened can run a quick search using a search engine such as Google. Before you deposit your thesis in ORA you will need to agree to the ORA grant of non-exclusive licence. This licence sets out both the depositor's and the Bodleian Libraries' responsibilities. It is necessary so that the Bodleian Libraries are able to store your thesis for the long term and make it available via ORA. Copyright in the thesis usually rests with the author: this does not change when depositing your thesis in ORA. The author does not give away any rights to the Oxford University Research Archive or the Bodleian Libraries. However, please see information on third party copyright.